The Canon Speedlite 320EX might be just the right size for you, not too big and not too small. The 320EX is Canon's mid-size flash gun. Is the Speedlite 320EX the right one for you? It's more robust than the 270EX II, but smaller and easier to handle than the full-sized 580EX II. As you go up in number power and price go up to. The pint-sized 270EX II takes only two AA batteries. 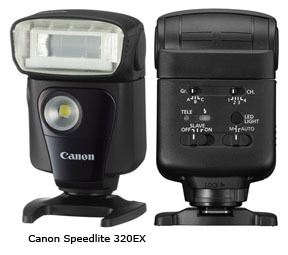 Canon introduced the Canon Speedlite 320EX and 270EX II early in 2011. 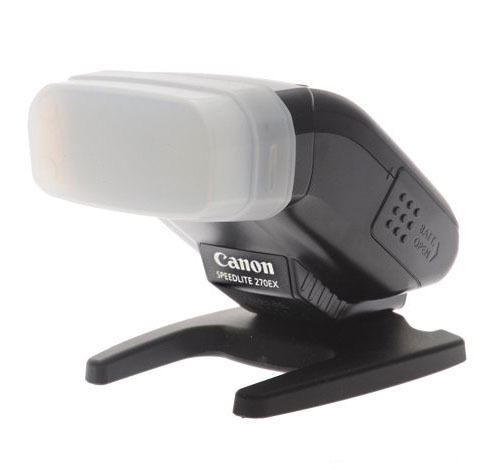 The 320EX is Canon's first flash to have a small LED on its front surface. You can use for shooting HD video. In some instances you can even light close by objects for still photographs. The 320EX can also be triggered to fire remotely from controls on many of the properly equipped Canon cameras. Canon Camera designed the Speedlite 320EX to be both compact and powerful and is marketed toward owners of mid-range cameras. These flashguns are compatible E-TTL II (Evaluative Through-The-Lens 2nd generation)system. They all will give you more control over lighting and are valuable particularly when photographing people. They have bounce capabilities and can be used in multiple speedlite set-ups. The unique feature that sets the Speedlite 320EX apart is the Video Light Function. When used with Auto Light mode on a Canon Rebel T3 (1100D) or Canon T3i (600D), the LED automatically comes on when shooting Video in low light situations. The LED light makes the 320EX very unique. It's great for dark situations where your subject is close to the camera. 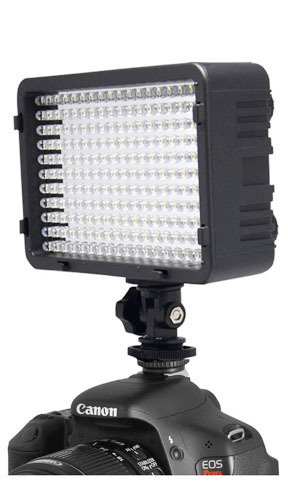 It is not going to give you any long distance or produce "professional" video lighting. Here is a photo comparison that illustrates why you really should own one of the Canon Speedlites. You can keep on taking crappy looking photos like the one on the left below. 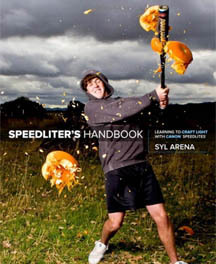 Or you can improve your lighting dramatically with a Speedlite. Strong back lighting without using fill flash on the left. In the middle photo, a speedlite was mounted on the hot-shoe of my Canon Powershot G11 and aimed directly at the subject. In the photo on the right I aimed my Canon speedlite flash straight up and held a large white card above the flash tilted forward toward my subject. The 320EX can be used on camera or as a slave unit. 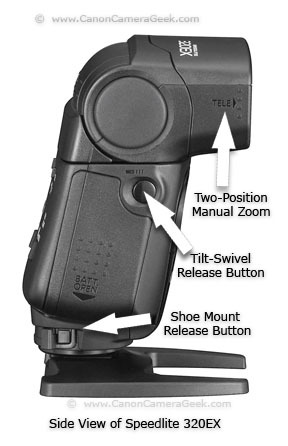 This photo of the left side of the Canon 320EX shows the two-position zoom, the tilt-swivel button, and the shoe mount release button. You can change the speedlite's coverage and guide number manually by sliding the flash head in or out, from normal to tele settings. This changes the guide number from 79 to 105. You can swivel and tilt the 320EX. If you have a few minutes, this video by Pete Steele is outstanding and showing you exactly what the good and the bad is about this flash. The Canon Speedlite 320EX takes 4 AA batteries. The Shoe-mount release button allows you a quick dismount. This flash is still fairly lightweight, can fit in a pocket, has a quick recharge cycle and is EASY to use. The LED is not super bright, so it's really only effective for close objects. As I've said before, it is important not to get too caught up in the technical specifications of cameras, lenses and accessories. Remember it's the practical features that you are going to have preferences for that match your own photography techniques. 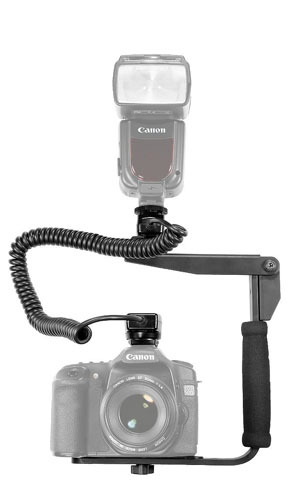 I am hopeful that you find these thoughts on Canon camera accessories useful and that you remember to enjoy your photography whether you buy a Canon speedlite 320EX, another Canon flash or worst-yet scenario ( just joking ;-) ) a non-Canon flash. The Canon Speedlite 320EX nestles in between the 270EX II and the 430EX II. It's nice simple change from the complexity of using the 580EX II. The controls are simple and are tactile and there is no distracting LCD screen. Add versatility to your Speedlite. Soften your light with a diffuser. 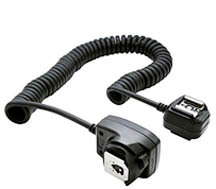 Increases the distance between your flash and the lens.